While I have a sizable collection of all different makeup products, setting sprays are something I don't normally accumulate. I love the idea of Japonesque's setting spray because it comes in an aerosol spray which provides a finer mist than a standard spray bottle. It's a must-have finishing touch for all your makeup looks, especially for the upcoming holiday weekend! With my oily skin, setting powders can only do so much. I love adding a setting spray to prolong my makeup even more and keep colors vibrant throughout the day. 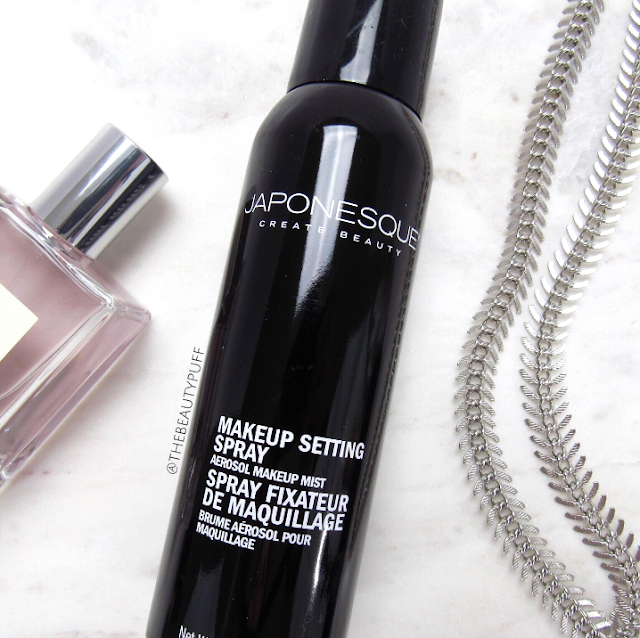 The Japonesque setting spray comes in a 3.0 oz aerosol spray that can easily travel with you and fit in your makeup bag. The spray itself is a fine mist, but I will say the very first spray was not even. I suggest spraying it once or twice into a sink before your first use. Simply hold the nozzle about 10 inches away from your face and press lightly to get a fine, even mist. Drying time was a bit longer than I had expected, but just be sure not to touch your face and allow it to completely set. Overall, I liked how this spray not only prolonged my makeup, but also minimized the look of powder on my skin. It gives a natural finish which I love. So when you're ready to put the finishing touches on your looks for the long weekend, don't forget your setting spray! You can find the Japonesque Color Makeup Setting Spray on Ulta's website below!